These are crappie at Oak Hollow. I originally was watching the DI screen and thought the returns were suspended leaves – They were EVERYWHERE. Switching to 2D showed the returns were too strong to be anything other than fish. I dropped some lines and boated a dozen. Here I’m moving directly over an aeration line at Oak Hollow. There are fish suspended within the bubbles in the water column between 20 and 22 FOW. Again, evident in 2D but not DI. 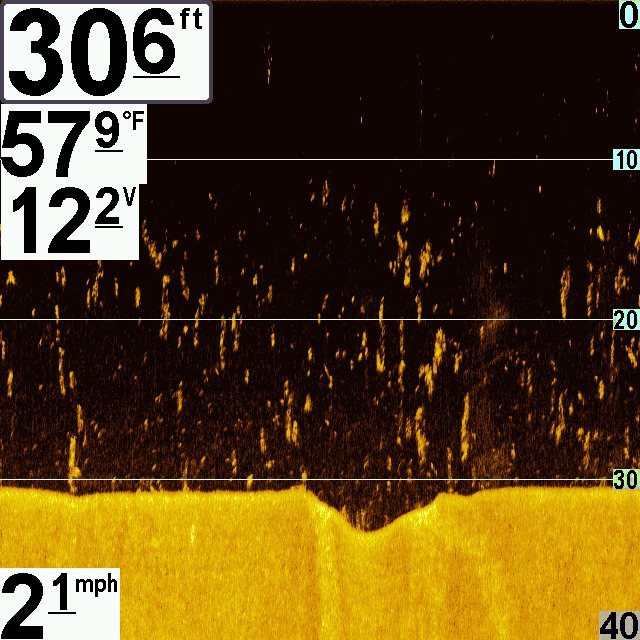 The SI view shows the fish as white marks within the water column, but not how deep they are. 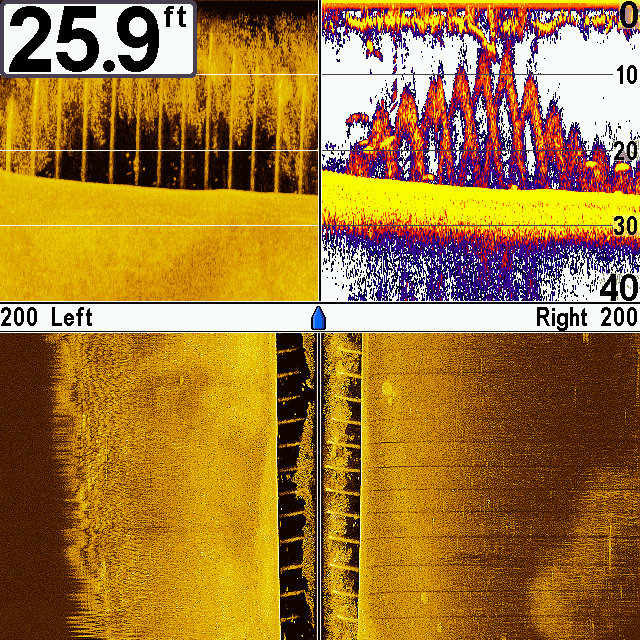 There is only one bubble pipe, directly under the boat – not two parallel pipes like the SI view would indicate. Here I’m passing across a creek channel and an aeration line. The line is obviously running diagonally from left to right but the DI view would have me thinking otherwise. Also you can’t really differentiate between fish and bubbles on the DI view. On the 2D view you can’t really make out what the “structure” is but you can certainly see the fish returns within it. Again the SI view shows the fish as white marks, but you can’t see how deep they are. This is a Humviewer shot of fish attractors at MIL. 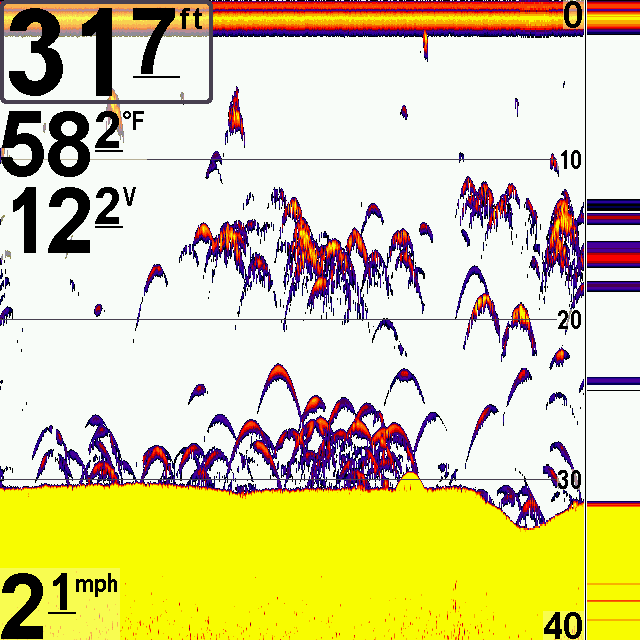 Here there’s a baitball ~8′ to the right, fish attractors ~20′ to the left, and fish on the right opposite the attractors. Both 2D and DI show the baitball but you can’t tell where it is left to right since it’s in the water column. On the DI screen, the fish attractors appear to be on the right, not the left. The 2D shows the attractors and the fish, but you can’t tell that the fish are nearly 40′ away from the attractors. All three views working together really paint a good picture but the individual views can be misleading at times. So to the original question, yes I think the DI is worth the money but only if you have the SI view to give perspective. 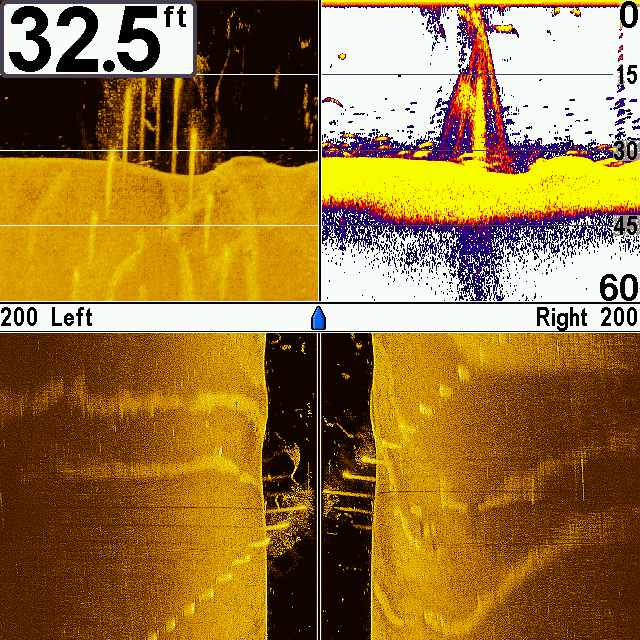 Also DI is really only good for viewing structure, not fish so without 2D to show the strength of the return (Lowrance DSI’s for example) you’ll always be guessing what your looking at.